Come and experience the thrills and excitement of whale watching the way it was meant to be onboard the Five Star Supercat! The "Fast Cat" provides pure wind-in-your face excitement in the finest west coast tradition. Her sleek lines and comfortable seating provide all the "open boat" thrills and excitement that anyone would want while her indoor seating provides the comfort and safety that our guests expect while crossing the water at 30 knots. Our expedition's catamarans have been rated by amateurs and professionals alike as the best of their type for viewing, photographing, and filming the natural images of our beautiful coastline. Our crews of experienced, trained naturalists are on board to guide and assist you throughout the journey. Enjoy covered out of the weather seating and elevated viewing platforms creating a level of comfort and convenience to satisfy adventurers of all ages. During the months of April through to the beginning of October the salmon populations are migrating through the Southern Vancouver Island area on their way to the spawning grounds. During these months, our resident Killer Whales spend much of their time around Victoria and San Juan Island feeding on the natural abundance of salmon, one of their principal diet sources. 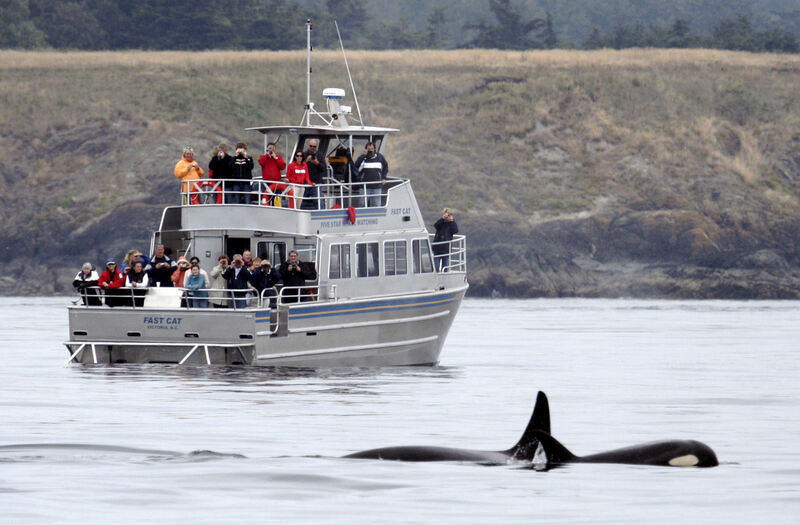 Our extensive spotting network and years of experience in locating the whales ensures a very high success rate for our tours. Come join us for the thrill of a lifetime! You are advised to wear layered clothing pants, rather than skirts or dresses as the weather conditions can be windy and the air may be slightly on the cooler side. Casual shoes are recommended for on the boats; please no pumps. You may want to bring sunscreen, sunglasses, a bottle of water, your camera and film, and binoculars. For our environment, our catamarans are fuel efficient and designed with drive systems that minimize underwater noise emission: 'Whale Friendly', if you like. There are restroom facilities for our guests' comfort and the latest in safety and navigational equipment. There are no passenger restrictions on this tour. All ages are welcome. Children 2 and under are free. Come by and visit our gift shop and browse through our wide selection of clothing, local artwork, books, memorabilia and much more!